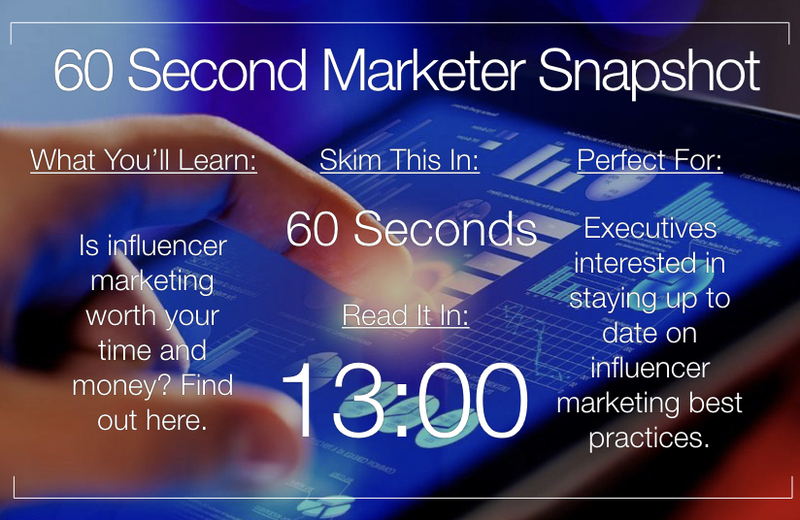 Do you want to learn more about influencer marketing? If you’re like many people, the answer is a resounding yes. After all, businesses of all sizes are finding new and innovative ways to use influencer marketing to grow their sales and revenues. But the question remains — what are the best ways to use influencer marketing and what landmines should you know about before launching a campaign? In this article, we’ll show you exactly how powerful influencer marketing can be; we’ll provide important insights to consider when planning your influencer marketing campaign; and we’ll conclude with some of the challenges you might face as you launch a program of your own. Influencer marketing has been around us ever since there were “famous people,” “brands” and “media,” but with the growth of social media, the scope and shape is reaching new heights to a status that is nothing like before. When you think of the word “influencer,” you might associate the term with very well-known celebrities, such as Selena Gomez or Kim Kardashian: somebody who even your parents might recognize. But “social media influencers” are not necessarily analogous to traditional celebrities. Some of the most influential social media influencers become famous online and not through a TV series. They also openly and actively broadcast their lives for their followers, which might not be the case for some high-end celebrities. Now, with that being said, it doesn’t mean anybody is entitled to be a social media influencer. They are famous for being knowledgeable and up-to-date on a certain topic. Usually, have very high number of followers. Frequently update their social media accounts. Occupations include (but not limited to): ordinary users, bloggers, to industry experts. For example, here’s a screenshot of Aimee Song’s Instagram account (@songofstyle). Aimee is one of the earliest fashion bloggers with over 2 million users visiting her blog every month. Currently, she has 4.9 million followers and has posted over 8,700 posts on her Instagram account. Aimee is no Hollywood celebrity, but her expertise in fashion and her ability to update eye-pleasing, inspirational content has made her a global social media star. The younger audience looks up to her because of her successful career in fashion, while her account is an inspiration lookbook for the more mature audience. Some of her content is indeed branded and sponsored by fashion and beauty brands such as By Terry, Olay, and Lou & Grey. How popular is social media influencer marketing today? Influencer marketing is an ongoing and outgrowing phenomenon. In 2017, Linqia, a content marketing platform, released a report that showed that more than 90% of marketers who use influencer marketing considers it an effective strategy. Additionally, approximately 40% of marketers planned to increase their influencer marketing budget in the upcoming year. Influencer marketing has been especially powerful on visual-rich platforms such as YouTube, Instagram, and Snapchat. According to Klear, an influencer marketing software platform, the sheer volume of influencer posts on Instagram drastically increased between 2016 and 2017, reaching more than 1.5 million posts in a single year. Keep in mind that their data only looked at posts with either “#ad” or “#sponsored” hashtags, which means that there might have been a lot more posts out there that disclosed itself differently. In fact, social media influencer has become so popular that marketers pay up to $10,000 a post to influencers to feature their brand. Does it lead to purchase? The answer is YES! In a report by Twitter, approximately 40% of its users have experience purchasing something “as a direct result” of an influencer’s post. The report also showed that when consumers were exposed to only a brand’s post versus both brand and influencer’s post, the purchase intention goes up by more than double the percentage when they saw both brand and influencer’s post. Additionally, when campaigns utilized both the brand and influencer’s tweets, brands experienced a tremendous increase (5 times higher) in consumer’s brand awareness, ad recall and willingness to purchase the brand compared to when the brand only utilized traditional online ads. Now, this is pretty impressive. Endorsements by influencers can really boost your campaign performance because while content that is promoted by the brand only reach the brand’s followers (or people who’ve been exposed to the brand’s content multiple times) the audience that influencers reach can be a lot more diverse and new. Even better, the new audience might be more responsive to the campaign than the brand’s followers, because a new brand might be a refresher in the midst of their usual go-to products. According to Google’s survey of teenage YouTube subscribers, 70% indicated that they are able to relate to YouTube creators more than traditional celebrities. Given that influencers more strategically and actively manage their social media accounts, they more actively interact with their fans. Therefore, engagement with influencers are much higher than with traditional celebrities. On YouTube, videos owned by influencers had three times higher views, double the amount of actions (e.g., liking, sharing) and 12 times as many comments than videos owned by traditional celebrities. And more importantly, 60% said that they prefer advice by influencers about products and brands over recommendations by traditional celebrities. Relatability is key attribute of influencers. Consumers regard influencers more as a friend than a star, and this works! This makes sense if you think about it. We prefer advice from close friends who we feel comfortable with and identify with, not from somebody who we feel distant from even if we idolize them. 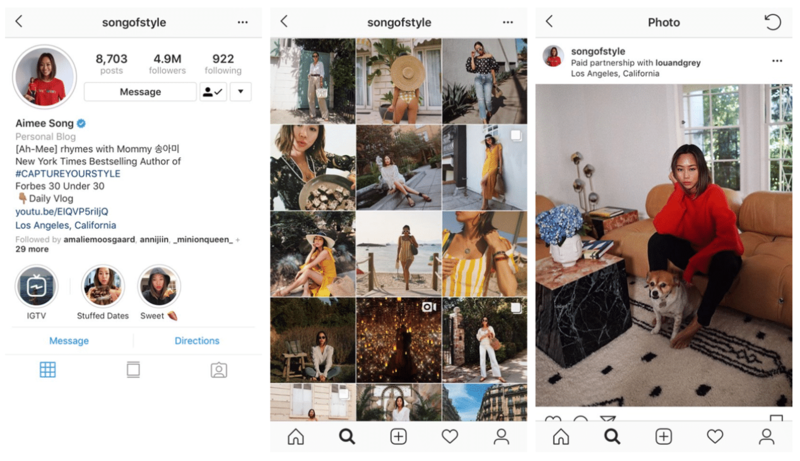 Micro influencers, as opposed to macro influencer celebrities, are hyper-specific influencers who have a relatively lower follower count in a given niche. The range of the number of followers an influencer must have to qualify as a micro-influencer is subjective, but it is generally considered to be somewhere between 10,000 and 500,000 followers on social media channels. Also, it’s the engagement level of those followers that matters more than the number of influencer’s followers. Micro-influencers have specific niche audiences that are deeply connected and intensely engaged. Several studies show that micro-influencers drive more engagement and hold better recommendation power than macro-influencers. Markerly conducted research on over 800,000 Instagram accounts (each with over 1,000 followers). They found that the more followers an account has, the fewer likes and comments they get, relative to their follower count. The engagement rate is much higher when using micro-influencers and since the cost is much lower than engaging a macro-influencer, it is safe to claim that the ROI of the partnership will likely be higher with the micro approach. In a separate study by Experticity, 82% of consumers reported that they were highly likely to follow a recommendation made by a micro-influencer. Micro-influencers were found to have more conversations about buying recommendations and greater power when driving actual conversions than macro-influencers. Consider the resources available to you: Are you going to compensate with money or offer products/services? Flat payment per post? Promo codes? Outline your objectives: Is it to drive awareness or help you generate content? Keep ROI in mind. Instead of just ‘boosting awareness’ stick to metrics-based goals (e.g., driving 3 times as many sales). Develop a basic strategy: What kind of content would work? What channels would you want to work on? How often would you want to post? What products are to be featured? In what format? For how long? And so on. Use hashtags: Search for hashtags relevant to your company, product or market on social channels to find the top posts and influencers who are already interested in your product. Search through your followers list: Search your followers list to see if any of them are already fans of your product or service and if they have a good following. Use relevant tools: To save time and if you can afford to invest some bucks, try using tools that can help you find the right micro-influencers. This will be discussed more in depth the following section. Take advantage of high-tech tools and services that can help you get started with selecting the right influencer and also manage the campaign. Tapinfluence and Upfluence are two of the many services out there. You can also check out Influence.co, BuzzSumo, Insightpool and HYPR for more. If you thought there’s not much difference in how a 22-year-old and a 45-year-old might consume and digest social media, you might want to give it a second thought. Not only are younger users (13 – 24 years) more active on social media, but they are also more involved in their selection of who to follow. According to a report by Twitter, compared to older users (45 years and older) who follow only mainstream celebrities, younger users follow a more diverse types of influencers including mainstream as well as non-mainstream. This means that younger users are more proactive in looking for influencers that match their interests and qualify as follow-worthy. And when they find that perfect match, they’re probably going to appreciate things that the influencer posts and endorses! Influencers are wanted. Disclosure is wanted. The United States Fair Trade Commission (FTC) is challenging influencers to be transparent. Mobile Marketer reports that only 25% of the Instagram influencers from one study met the FTC’s compliance guidelines by disclosing their paid sponsorships. The study oversaw 800 social influencers’ accounts based in the United States, Canada, and the United Kingdom. The FTC is threatening to give fines and pursue class action lawsuits against influencers that are not disclosing paid sponsorship. A business blog on the FTC’s website called ‘Three FTC actions of interest to influencers’ tells the case of the FTC’s enforcement and how influencers can avoid it. The FTC enforced a complaint against individuals Trevor Martin and Thomas Cassell, who acted as influencers on YouTube, Twitter, Facebook, and Twitch for promoting their experiences –– winnings ––on a gambling website called CSGOLotto.com. The problem was Martin and Cassell did not disclose that they were the owners of CSGO Lotto. They also paid other users with cash and virtual currency to only positively promote CSG Lotto. The blog also reports that the FTC has sent out warnings via letters to other members of the influencer community. Clearly disclose when you have a financial or family relationship with a brand. Don’t assume that using a platform’s disclosure tool is sufficient. Avoid ambiguous disclosures like #thanks, #collab, #sp, #spon, or #ambassador. Don’t rely on a disclosure placed after a CLICK MORE link or in another easy-to-miss location. Consider your own viewing habits on social media. In order words, if you’re an influencer, plaster the paid brand sponsorship in plain sight for the world to see as an influencer, even if it has to be in the video or image itself. We mentioned in the previous paragraphs that influencer marketing impacts sales, according to a Twitter report. However, marketers are still unsure if this is really the case. One of the biggest challenges behind influencer marketing is measuring its unique impact. The 2017 Marketing Week article, ‘What’s the ROI of influencer marketing?’, tries to ascertain ROI for influencers. The article mentions a survey conducted by Rakuten Marketing, an internet marketing solutions company, which reported that 38% of marketers are unsure whether influencers actually drive sales. The article mentions a company called Mediakik that reports that brands spent over $1 billion (which the article puts in the pound sterling currency of £776.7 million) for Instagram influencers in past years, basing the cost on the amount of sponsored posts. How do fake followers/accounts impact influencers? Be cautious of relying on the number of followers as a true sign of brand engagement. Some of the biggest social media influencers have been caught with fake followers, usually created by bots, which creates a misrepresentation of who really likes and responds to the brand’s posts. Whether within or beyond the social media influencers’ control, fake followers can generate a feeling of mistrust to real followers: admirers of the brand. The New York Times article ‘The Follower Factory’ lead with the story of Jessica Rychly, a real social media user who became a victim of social identity fraud on Twitter when her account was duplicated: using her images and bio. The fraudster (fake account user) followed and commented on other Twitter accounts in foreign languages and promoted pornographic content: all while pretending to be Jessica. The effort taken by the fraudster to act as Jessica on social media was bizarre but not uncommon. Uncovered in New York Times’s Follower Factory article was that Devumi, dubbed as an “artificial engagement company”, was the supporting force for the fraudster to carry out these actions. 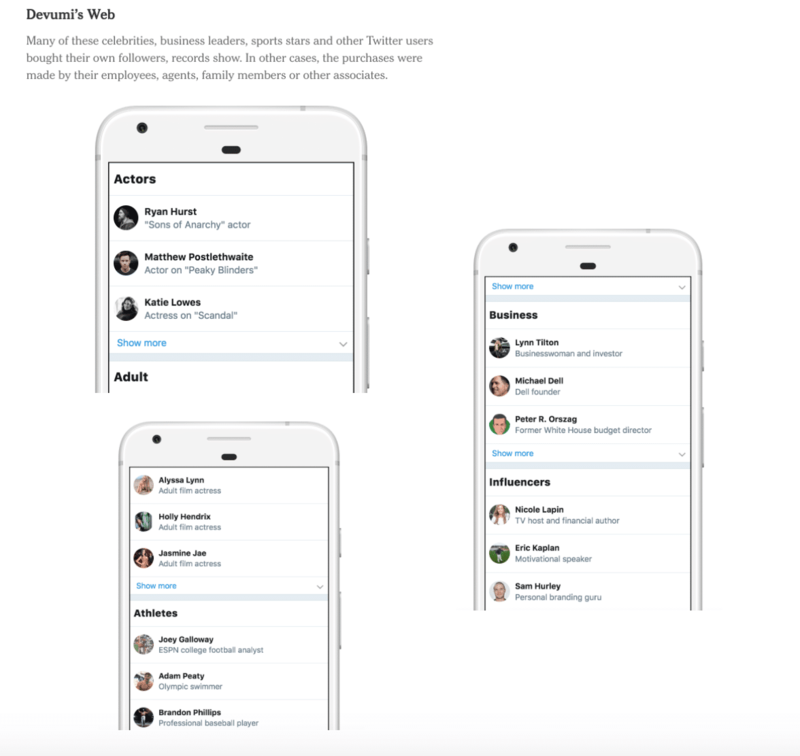 Apparently, Devumi plays a very active role in this controversial practice as Devumi users can buy “Twitter followers and retweets” to gain “influence online”, with Devumi offering “3.5 million automated accounts” and “200 million followers” to its Twitter customers. The Follower Factory reported Facebook’s disclosure among its investors of “at least twice as many fake users as it previously estimated, indicating that up to 60 million automated accounts”, pinpointing that the bots has the ability to “sway advertising audiences”, “reshape political debates”, “defraud businesses and ruin reputations”. With the huge sum of money that’s attached to a number of followers, the situation comes as no surprise for people faking followers. 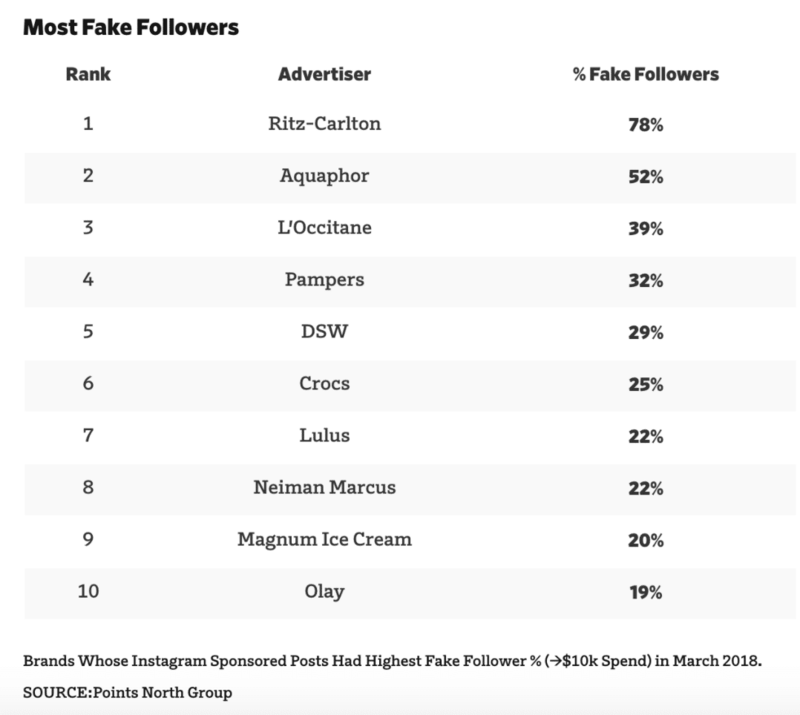 According to an AdAge article published in April 2018, a study by Points North Group, a third-party influencer marketing measurement group, found that major companies were among the Top 10 companies that were promoting influencers with fake followers. Procter & Gamble Co. was listed twice in the Top 10 with its two brands: Olay and Pampers. Olay was ranked #10 with 19% of fake followers. Pampers was ranked #4 with 32% of fake followers. The Ritz-Carlton was ranked #1 with 78% of fake followers. How do you reduce fake awareness/engagement? The number of fake followers have been hammered into the minds of all of us, at disparaging levels, at this point. Sway employs a team of reviewers that is active in overseeing fake engagement by following their list of quality control principles: knowing your influencer, battle bots, and knowing what you’re looking for when monitoring for fraud. In the AdWeek article, Sway stated its team examines and flags each post for comments’ “verbiage” and “the quality of [the influencer] engagement” to make decisions on whether the engagement is fake or real. Sway learns the presence of its influencer over a long period of time. Sway can “know what kind of content performs well with [influencer] communities” and “ align them with campaigns” that can be very successful. Sway can acknowledge if the content is “off”, or inaccurate, before the content goes live. By rating influencers on “quality of their content, engagement and performance”, Sway puts measurable standards in place for influencers to avoid fake engagement. Knowing the influencer makes spotting “unnatural spikes in followers” and likes easier, where unnatural spikes could be the work of click farms or bots. For battling bots, when in doubt, Sway stated it will “remove the metrics from the influencer” and alert the influencer after “flagging the fake engagement,” which could be unknown to the influencer. Sway said it will listen carefully to the influencer’s response and take action as it will “blacklist them from our network” if the influencers are using bots. Sway advocates for collaboration among industry colleagues to rid this sketchy behavior: “The influencer marketing industry will not continue to thrive without truth and transparency”. For truthful, organic, vital engagement, Sway stated assessing 1) follower growth over time, 2) engagement, 3) engagement rate problems, 4) hashtags, and 5) historical campaign performance will be beneficial. Large growth over small time signals red flags. Suspect accounts during huge growth (for unknown reason) should be watched. Disproportion with followers and engagement should be watched. For example, a red flag may be where followers may exceed engagement – post comments, post likes – by 300%. Heavily used hashtags should be filtered as they are easy targets for spammers and bots. Past campaigns should be researched to decide multi-campaign correlations between great content and positive response. Influencer marketing is rising for social media as brands find ways to attract customers and users find ways to gain authority. Influencers can be anyone with the drive, expertise, and poise, to speak or act on any topic. Influencer marketing can be worthwhile – meaning positive awareness, positive engagement, and positive surplus of money for both influencer and brand – if the influence is truthful, transparent, and relevant. Influencers should attempt to reach audiences naturally: only using great content and personality. No fake followers. No bots. Influencers should disclose any paid brand sponsorships to consumers: whoever remains afterward are keepers. Otherwise, the influencer and brand risk backlash from the ones who matter most: the consuming audience. Be truthful, transparent, and relevant to influencer marketing. About the Authors: This post was researched and written by four graduate students from the Stan Richards School of Advertising and Public Relations at the University of Texas. Mikel Moon will be graduating in 2019 with an M.A. in Advertising; Jung Ah Lee will be graduating in 2021 with a PhD in Advertising; Sanjay Adhikari graduated in the summer 2018 with an MA in Advertising; and Jean Yang graduated in the summer 2018 with an MFA in Design.